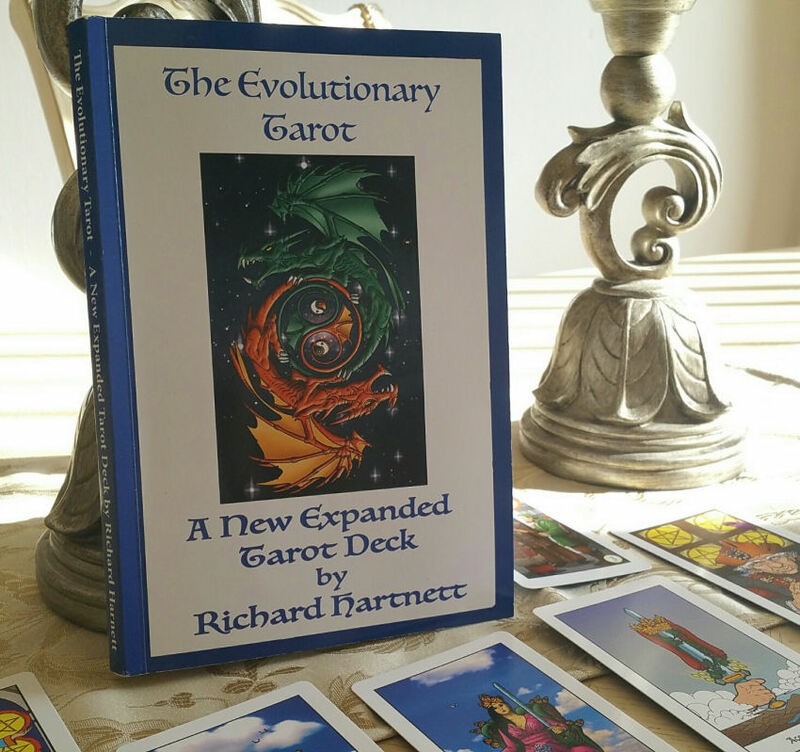 Richard Hartnett undertook the creation of an expanded tarot deck system with bold ambition. He sought to stitch history, mythology, and science together through a defined point of view rooted in quantum spirituality. The result: The Evolutionary Tarot, a self-published deck of eighty-four cards. Hartnett’s proposition of quantum spirituality is about brokering peace between diverging paradigms– science and faith, conservatism and evolution– a tarot deck that can harmonize dualism. While being mentored by a medicine woman named Tu, Hartnett arrived at the realization that the tarot deck structure as-is was missing certain pulse points he had intuited to be in this world of ours. His mentor Tu told him to trust his own intuitions. And from there, he set out to create an expanded tarot deck system. 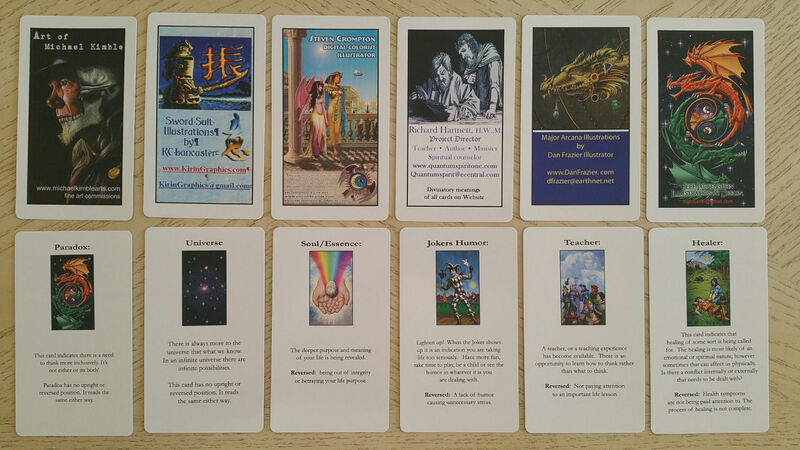 The underpinning mission of harmonizing dualistic thought is depicted on the card back design of the box. 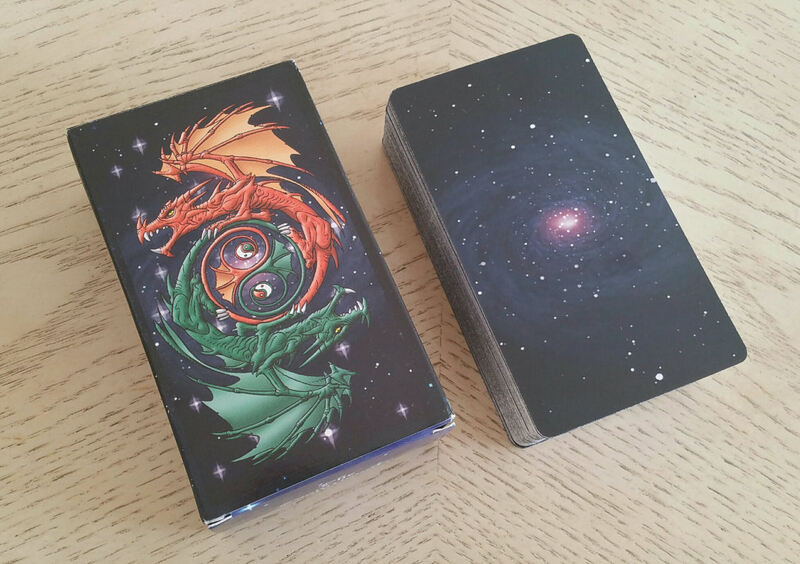 The card back design is of a solar system. Okay I’m going to be super honest here. I didn’t like the card back design when juxtaposed with the art style of the tarot deck. The art style is hand-drawn, graphic novel style (with some digital additions, such as the clouds in the background of some of the Minors, see: Queen of Pentacles, Knight of Cups, or Three of Cups for examples) that feels classic and iconic, and then you have the card back, which feels New Age-y and intergalactic. I’m not a fan of the card backs. Also, they’re not strictly reversible, meaning the art isn’t symmetrical along the vertical, but since it’s just stars, you’re not likely to notice whether it’s upright or reverse, so yeah, you can totally read with reversals here. Now let’s get into the Majors, which I’m really excited about. I love what the creator has done here. 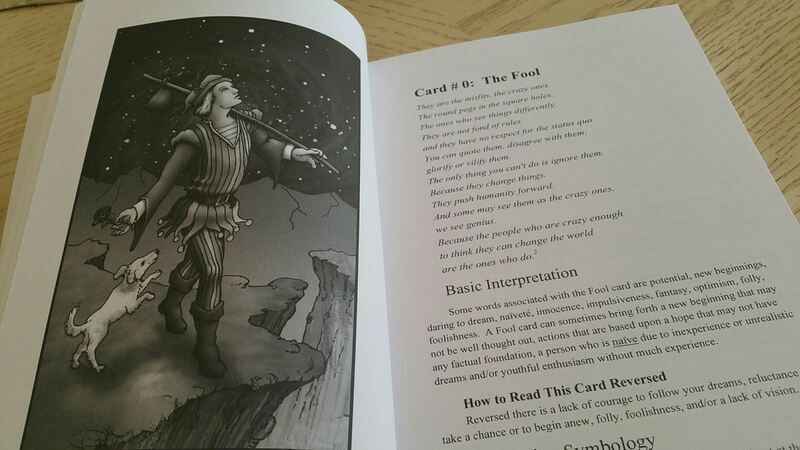 Hartnett explains how The Fool card in traditional tarot isn’t exactly The Joker’s equivalent , which means perhaps we’re missing the Joker archetype among the Majors. Thus, The Joker card is added in to this deck. Same with Universe, which was inspired by the William Blake Tarot deck. And on it went until twenty-seven Major Arcana cards came to being. 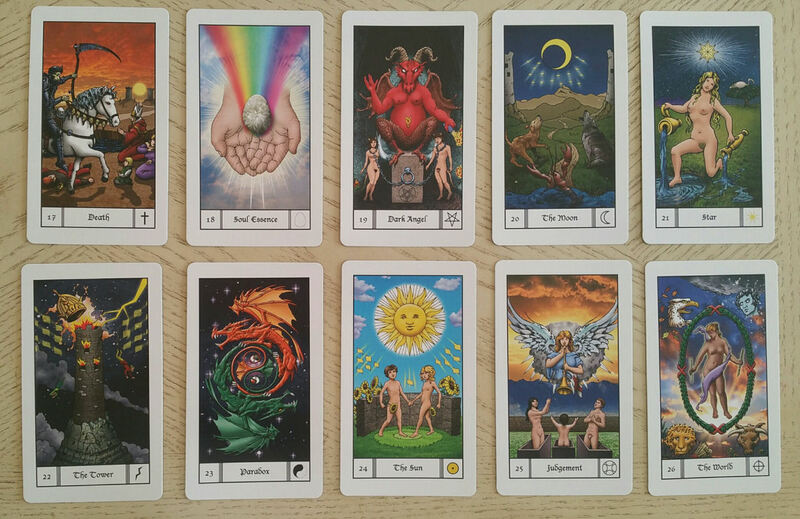 The renumbering of the Majors is significant in this tarot deck. Hartnett has renumbered the cards according to numerology. Now with these twenty-seven cards, you can align them in three rows of nine cards each. Each of the nine columns bear numerological significance, so for instance, Keys 1, 10, and 19 are in column one, so they relate to unity and individuation. Cards 2, 11, and 20 relate to polarity, duality, and oppositions. Cards 3, 12, and 21 relate to creativity and self-expression, etc. The first row, Cards 1 through 9, represent archetypical personal power; the second, Cards 10 through 18, archetypical motivations and influences; and the third, Cards 10 through 27, transpersonal power. This all plays into the narrative of quantum spirituality with perfection. The additional cards to the Majors are: The Healer (Key 6), The Teacher (Key 9), The Joker (Key 11), Love (Key 12), Soul Essence (Key 18), The Dark Angel (Key 19), Paradox (Key 23), and then though not “new” per se, this deck contains both The World card and The Universe, Keys 26 and 27 respectively. 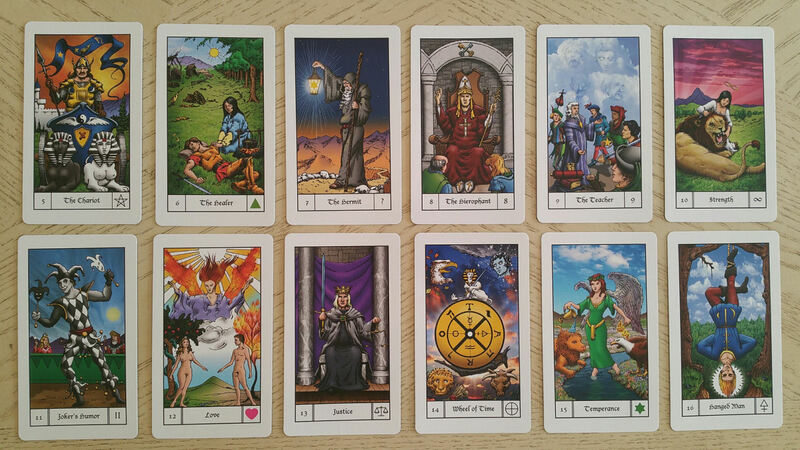 The Minor Arcana has preserved the RWS system of tarot rather loyally. For instance, in the suit of Wands, you can see the heavy RWS influence, which of course I love as an RWS reader. I love the homage to Egyptian symbolism in the Queen and King of Wands. Psst…you can click on any of the photographs of the cards for a close-up viewing. I deeply appreciate the inclusion of multiculturalism and diversity in this deck. It’s also seamless and doesn’t feel forced. Style-wise, the illustrations have that All-American comic book or graphic novel feel to them. I do love some of the interpretations of the RWS system here. For example, check out that Four of Swords. I dig it. Since I identify as the Queen of Swords for my significator card, I always take a peek at how a deck creator has interpreted the Queen of Swords. Here, I love her. Omigosh, I love her so much. The illustration style of the cards remind me a bit of the Robin Wood Tarot and even the Morgan Greer, especially back in the Wands suit–some of those cards have a distinct Morgan Greer flair to them. There’s a retro feel to the art that takes me back to the 90s. Five artists have illustrated the deck: Steve Crompton, Dan Frazier, Jeffery Laubenstein, KC Lancaster, and Michael Kimble. Sometimes when multiple artists have contributed to a deck, art style compatibility can be an issue, but here, I didn’t find it to be disjointed, so the multiple artists approach worked here. Now let’s talk about card quality. I like the thickness and the coating on these cards render them quite easy to shuffle, even with the slightly larger deck. (For those who have shuffled a 78-card deck for most of their lives, you will feel the difference with shuffling the 84-card deck.) There is a slight sheen to the cards, but not high-gloss. The thick white borders are also iconic of 90s-style tarot decks. By the way just look at that Five of Pentacles. Isn’t that one of the coolest Five of Pentacles ever? I love it. There are some discussions among tarotists as to whether The Evolutionary Tarot is a tarot deck or oracle. I would say unequivocally it is a tarot deck. It’s an expanded version of the tarot and the discernment that Hartnett has invested in crafting his Majors and the structure of the deck are rooted deeply in tarot heritage. Above you’ll see some of the extra cards that come with the deck. I love that there are easy-reference cards for the new additions to the Majors. You also get a card featuring each of the artists for the deck. Now I want to talk about the companion book, which I’ve read cover to cover and am really happy I did. Just as an FYI, I almost never read the companion books cover to cover. Like…ever. If you get the Evolutionary Tarot, you’re going to want to. Hartnett is an incredible writer and his knowledge, insights, and experience with the tarot is unrivaled. 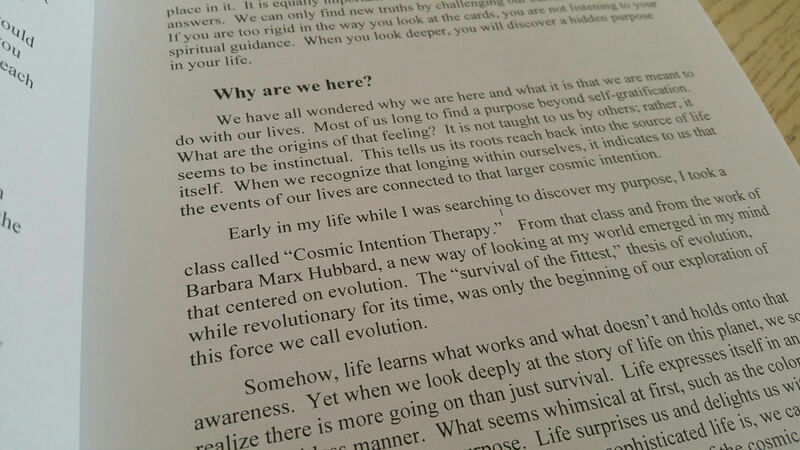 I learned so much about the tarot, a subject I thought I knew well, from Hartnett’s companion book. So the companion book is worth your while to read. 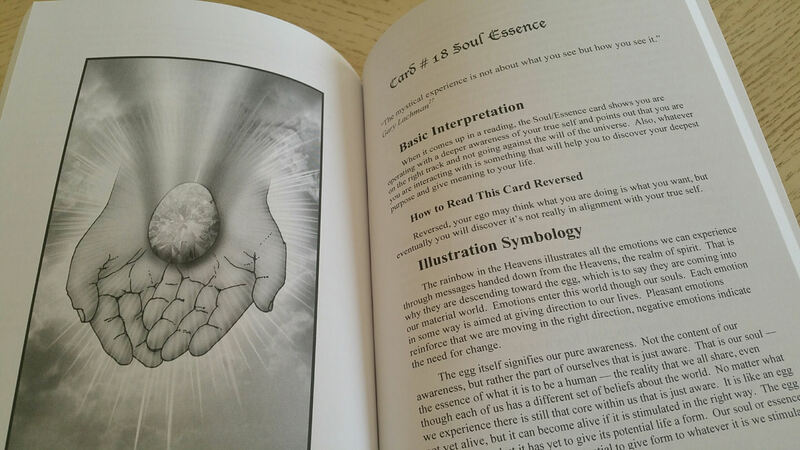 The text sets up the deck structure, its correspondences, and how to work with the deck in a way that elevates it to one of the better tarot deck operational manuals out there. However, it only covers the Majors and there’s no coverage whatsoever on the Minors. Thus, the guidebook is really targeted at the intermediate and advanced tarot reader, someone already intimately familiar with the tarot deck and tarot reading. It’s not a beginner’s manual. But it will deepen the seasoned tarot reader’s impressions of the cards. Hartnett’s occupational background is that of a spiritual counselor, and you absolutely see that throughout the companion book. I found the book to be an enriching read just for its philosophical content. Under The Empress section, for instance, there’s a beautiful section on the Garden of Eden as a metaphor in our personal spiritual evolution. In terms of working with an expanded tarot deck, specifically the new Key additions in The Evolutionary Tarot, this deck is targeted at spiritual counselors and those on a decidedly spiritual, mystical, or alternative religious path. The added archetypes–The Healer, Soul Essence, etc., even The Teacher are archetypes that are relevant and recurring considerations in the path of a mystic, but I’m not so sure it’s necessary in the paths of…well, non-mystics. I included The Teacher because this card conveys one who teaches esoteric subjects, not exoteric, or at the very least, that was the firm impression I got when working with the card in the context of this deck. Back to the actual guidebook. For each card entry, you get a quote that sums up the essence of the card, a basic card interpretation, how to read the card in reverse, a breakdown of symbolism in each card, and also a breakdown of the significance of colors. Then there’s an overview of numerological correspondences, the stage of the evolutionary journey the card represents, and then challenges and pitfalls. The deck delves deeply into numerological significance, so if numerology is your thing, you’re going to appreciate what The Evolutionary Tarot does with it in terms of correspondences in the tarot. 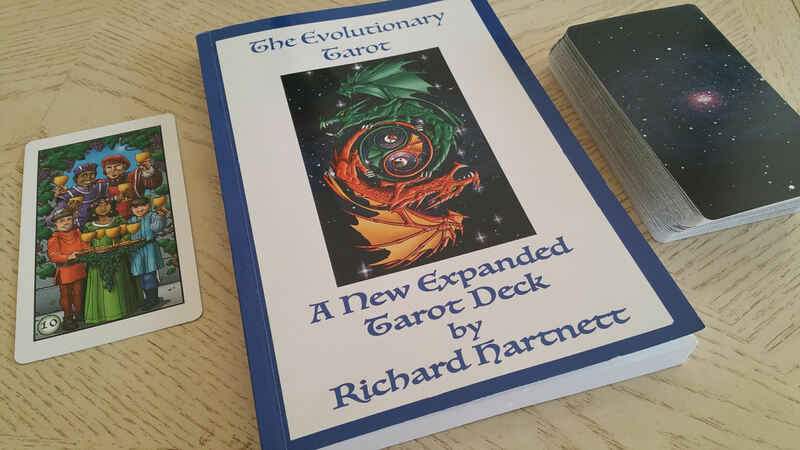 Hartnett’s thoughtful reinterpretation has resulted in not just an evolutionary but a revolutionary new tarot structure in the Majors. It works. And it works remarkably well. I found working with the Majors only to be impactful, especially with another deck, tarot or oracle. So, for example, I liked working with one of my recent oracle faves, Madame Endora’s Fortune Cards alongside The Evolutionary Tarot. Doing daily card draws with the Majors only, especially when I’m going through a personal immersion phase that’s spirituality-focused, works really well. 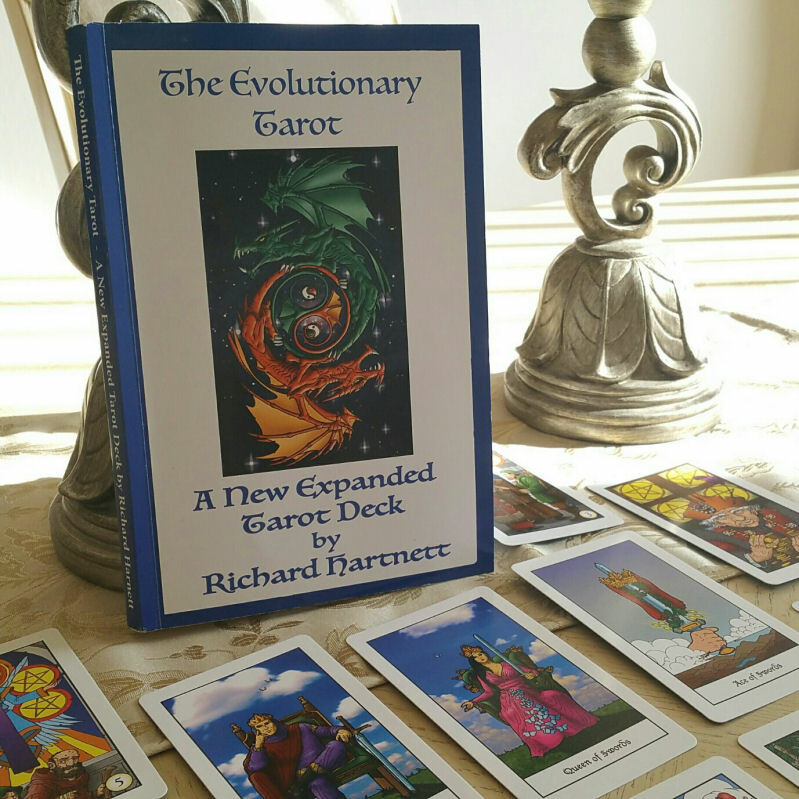 Among the tarotists who have reinterpreted the tarot deck structure into a new system, Richard Hartnett’s Evolutionary Tarot is among the best. There are a lot of reinterpretations out there that I, frankly, don’t like. This one, the Evolutionary Tarot, I do. It’s a tarot deck I would recommend to intermediate and advanced tarot readers and all tarot aficionados. If you hit a slump or plateau in your own tarot work, get this deck and work with Hartnett’s deck. It’s one of those break-through decks. Not only is it a break-through in the tarot world as a whole, it’s a wonderful deck for helping an individual reader break through a tarot slump. 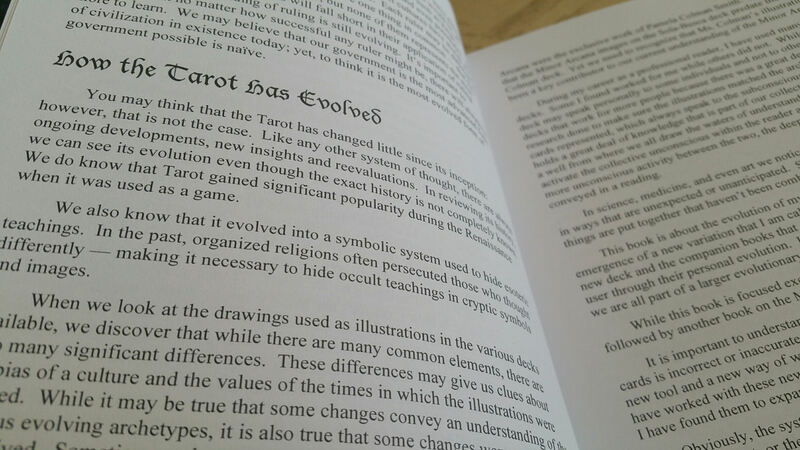 FTC Disclosure: In accordance with Title 16 of the U.S. Code of Federal Regulations Part 255, “Guides Concerning Use of Endorsements and Testimonials in Advertising,” I received The Evolutionary Tarot and its companion book from the deck creator for prospective review. Everything I’ve said here is sincere and accurately reflects my opinion of the deck.